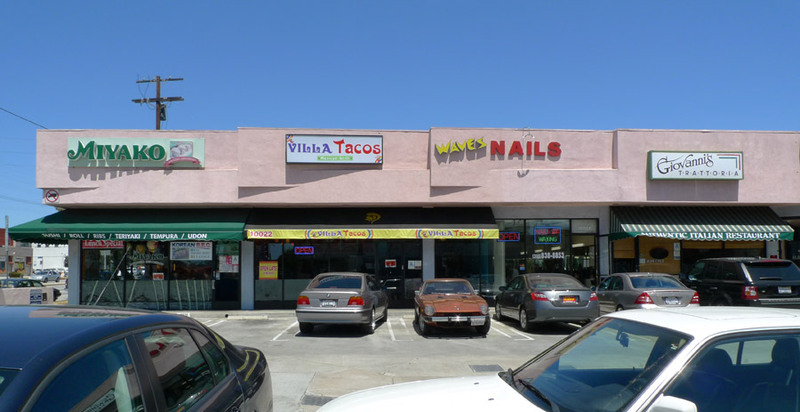 Villa Tacos opened about a month ago, taking over a space in a little corner strip mall in Culver City that was previously occupied, for a brief period in taco history, by Diablo Tacos. Villa did not look promising from the outside. It has the kind of graphic identity that seems to imitate amateurishly the look of fast-food chains, reminiscent of what you see at a university food court that thinks it needs to appeal to 18-year-olds who have grown up in such a way that they are most comfortable in branded environments. That look does not cater to my insatiable and arbitrary desire for Authenticity. Villa Tacos does nevertheless appear to be an independently owned little startup by an enterprising taco-man, and does possess the great virtue of being five minutes’ walk from my Culver City office, so there I went, for my 25th taco meal of 2010. And it was pretty good, so I wish them fortune, customers, and profits. Villa Tacos has a streamlined menu and what a popular website “Yelp!” reviewer termed Chipotle-style ordering – you choose taco, burrito, &c., and then specify one of six “meat options” (including “fish” and “vegetarian”, which if taken literally means they are serving the cannibal flesh of vegetarian humanoids, so I didn’t order that), and then have your choice of various toppings. Tacos are $1.95 each and quite large. I asked for three, and the serveuse plopped three large bumpy tortillas into the heaty iron press. 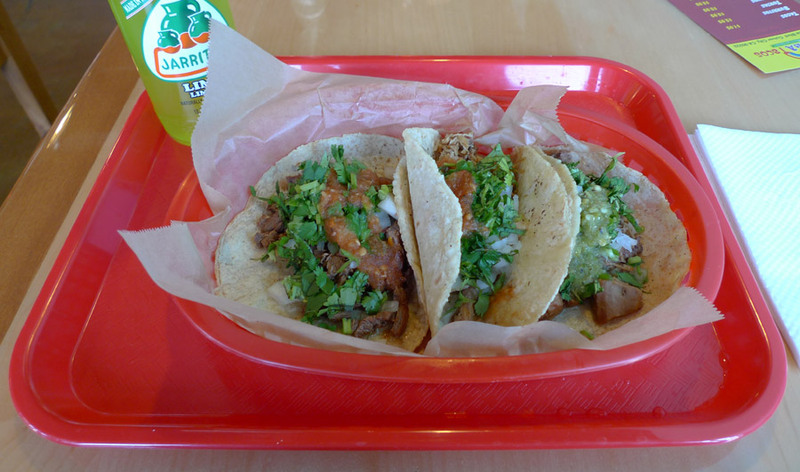 Then she removed them and filled them with my chosen meats, ranchera (equal to carne asada), carnitas, and lengua. Then we came to the toppings. I asked for cilantro, onions and salsa, naturally eschewing such goof toppings as cheese, pico de gallo, and sour cream. I chose the red “medium hot” on steak and carnitas, and the green “very hot” salsa on the lengua. My serveuse warned me that the green was very hot, and I responded positively. The foregoing was a discussion about ethics, which inevitably leads back to tacos. I ate first the lengua, for the same reason that I requested the hottest salsa with this taco – I was apprehensive. This was my first lengua taco, and I’m typically squeamish about eating guts and parts. I expected lengua to be chewy, pink, squishy, and lean, like my own tongue, I suppose; but this was not so. It was brown, moist, and tender and had a strong beefy, almost gamy, flavor. It was very good and neither gross nor disgusting. The green salsa was pretty hot (not compared to the Taurino, of course). The big, bumpy single-ply tortilla, although not leathery, was resilient and high-functioning. Next I ate carnitas. Considering all of these meats came out of a fast-food-Chinese-style steam tray, it wasn’t bad, although not too thrilling – moist with little textural variation. Finally I was left alone with the ranchera, which seemed to be simply a more evocative name for carne asada. This was the best of the bunch as well as the biggest – tender and flavorful; and it will be my choice next time. I went back there for lunch today. I tried the chicken, which was good, tasting like grilled marinated chicken. I also noticed that the serveuse was making tortillas by hand when not busy. So that’s why they were so bumpy!